How the struggling retailer -- and its stock -- could return to steady growth. 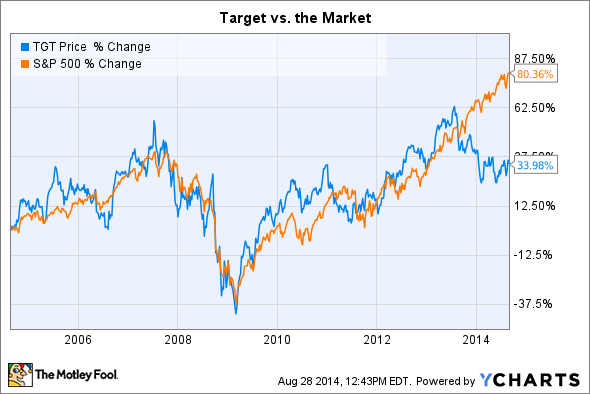 Target (NYSE:TGT) investors haven't had much to celebrate lately. The shares of the national retailer have fallen well behind the market since late last year. That's when the business started getting pinched from two directions. First, a holiday season reach of customers' personal information ballooned into more than $150 million of expenses and depressed shopper traffic levels. And then Target's expansion into Canada went from bad to worse, with losses growing into the billions. As dire as that sounds, Target, under new leadership, could mount a turnaround in the quarters ahead, which might spark a recovery in the stock. Here are a few of the biggest reasons why the retailer's shares could climb higher from here. There's no question that Target is struggling in its biggest market. Comparable-store sales growth was flat in the U.S. last quarter, as a decline in transaction volume offset an improvement in average spending per transaction. 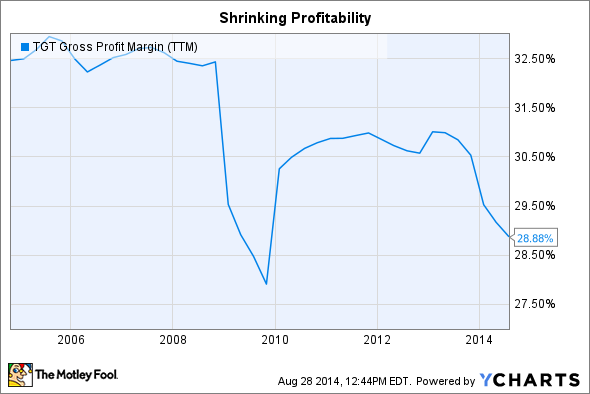 Profitability also fell thanks to stepped-up promotions. Gross profit margin was down more than 1 percentage point from last year. But those are problems that almost every retailer are having these days. Wal-Mart (NYSE:WMT), for example, posted flat comps last quarter as well, and also cut its profit forecast for the year. 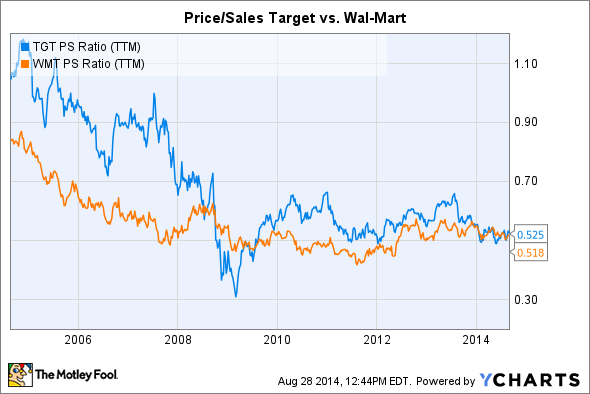 In other words, Target is doing about as well as you'd expect in a tough retail environment. But it wouldn't take much of a change to get sales growth back on track. Comps are already improving, albeit slowly. They were negative 0.3% two quarters ago, flat this past quarter, and trending at roughly 1% higher in July. If that rebound continues, Target could quickly find itself back at steady sales growth, with earnings growth just around the corner. Despite a 63% sales jump, the new Canada segment cleaved $200 million from Target's second-quarter earnings. And that loss was actually up from the $170 million hit in the prior-year period. However, Target's management is at least aware of the scope of the problem with this expansion. New CEO Brian Cornell said in the earnings conference call that the stores had serious pricing, inventory, and assortment problems that combined to "disappoint many of our Canadian guests." That's why the company is in the middle of what's basically a relaunch in Canada. Target is revamping its stores and adding products by the tens of thousands, including the type of exclusive and designer brands that local shoppers had expected all along. In fact, roughly half of the 70,000 products in a typical Canadian store will be new by the time we reach the holiday shopping season. Target didn't make a strong first impression on customers in this market, but finally offering the right product mix would go a long way toward fixing that mistake. A rising valuation would be the most direct catalyst for Target's shares to rise. But for that to happen the stock would need to be cheap right now, or at least cheaper than usual. And that's definitely not the case if you're simply looking at earnings. By that metric Target's P/E of 25 is actually the most expensive valuation the retailer has seen in a decade. But remember, those Canadian losses have depressed profits recently, which makes Target's P/E ratio look inflated. A better metric might be price-to-sales, which doesn't paint the retailer as particularly overvalued. TGT PS Ratio (TTM) data by YCharts. In fact, at roughly one-half times sales, its valuation is near a three-year low and sits at about the same ratio as Wal-Mart's, despite Target's higher profitability. This suggests the stock has some room to grow -- if Target can overcome its recent struggles in the U.S. and Canada.